Audio Pro Allroom 5.1 review | What Hi-Fi? 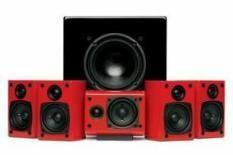 This Audio Pro package is, at first glance, a tidy attempt to combine compact, appealing and colourful looks with the sonic performance you'd expect from speakers that look like they've been vigorously interrogated with the ugly stick. The Allroom 5.1 is available in an array of bright colours, as well as the more conventional (though still shiny) white and black. It consists of five identically curvy satellites – the centre speaker is provided with a small, tray-like stand so you can sit the speaker on its side. The sub is fairly compact, and won't dominate your living room: it boasts 150W of power allied to a 6.5in long-throw driver and a downfiring reflex port. It isn't the heftiest in terms of sheer weight or power, but it's pretty articulate, and integrates with the satellites fairly well. And yes, they are impressive, those compact little speakers. The design differs from rivals in that it doesn't seek to equate ‘small' with ‘as invisible as possible': what you get is a package that sits proudly yet discreetly in your living room. Most importantly, they sound good. The Audio Pros conjure a smooth, cohesive and realistic performance, with seamless integration and a solidly impressive soundfield. Tested with the high-octane action of Letters From Iwo Jima, they respond with a cool, calm and largely revealing presentation. The overall tonal balance is convincing, and they deliver a pretty open midrange for their comparatively small size. The only drawback is that they can't summon the dynamic sweep of their best rivals. The Allroom package is marginally restrained in its presentation, robbing soundtracks of some excitement. With a thoughtful movie like Sunshine it's no problem, but more dynamic fare leaves you feeling somewhat shortchanged. Of course, the Audio Pros' compact, attractive design will win admirers (the class leaders at this money tend toward the cumbersome), but in the end, it's back to our mantra of ‘sound per pound'. On that basis, Audio Pro just misses out on that fifth star.